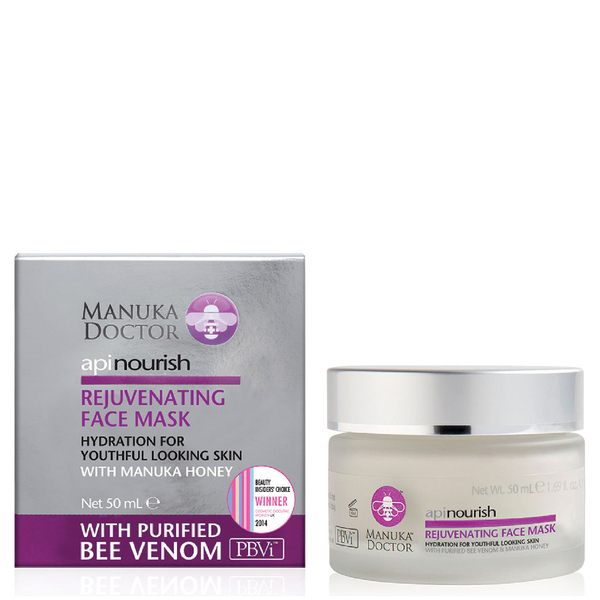 Treat tired, dull and mature complexions with the ApiNourish Rejuvenating Face Mask from Manuka Doctor, a deeply penetrating mask with powerful naturally sourced ingredients. Skin will be left feeling firmer, revitalised and youthful-looking. 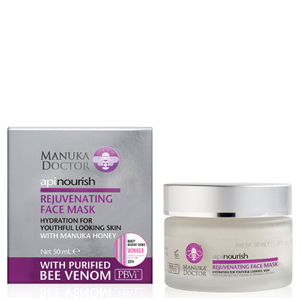 Enriched with collagen boosting Purified Bee Venom™, the anti-ageing mask naturally uplifts, combats wrinkles and encourages the regeneration and repair of skin cells. Manuka honey provides a moisture surge, improving elasticity and texture, whilst royal jelly is renowned for stimulating collagen production to reduce the look of fine lines. The lavishly creamy formula is quickly absorbed, leaving skin ultra-hydrated and sumptuously smooth. Use the face mask once or twice a week as a luxurious treat for your skin. Apply to the face and neck after cleansing. Leave the mask on for 15-30 minutes depending on skin type. To remove, gently wipe off with a damp cloth using upward movements. Can be used as an intensive leave on moisturiser or as a mask.